With the HoloMonitor system, cellular behavior, responses, and events can easily and continuously be visualized and quantified over time. Microscopy images are recorded directly in the cell culture vessel at regular time intervals, to not overlook any significant events. 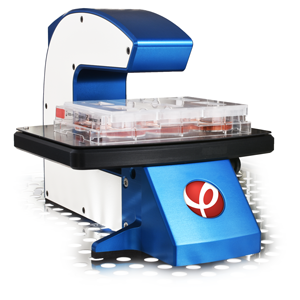 The laser and base units are used to capture time-lapse holographic phase images of cells. The system is controlled by proprietary software, Hstudio, or HoloMonitor App Suite, available on the market from July 2018. Read more about App Suite here, or contact us for further information. The HoloMonitor M4 base unit can be permanently installed directly in a cell incubator, in a hypoxia chamber, or on the lab bench. The HoloMonitor M4 base unit can optionally be equipped with a motorized xyz-stage. With this high precision stage, the HoloMonitor M4 can record time-lapse videos at multiple locations in parallel. Sample locations can be within the same culture or in different cultures. The illumination source is a 635-nm diode laser placed outside the incubator and connected with fiber optics. Hstudio cytometric software allows the flexible and convenient set-up of experiments and of analyses of the huge volume of data collected during imaging. After sample locations have been graphically programmed, time-lapse video will be automatically recorded at each location. The motorized stage control software is fully integrated into Hstudio. After recording is finished, the cytometric software automatically identifies and tracks individual cells over time. An external computer is required to run the Hstudio software. Computer requirements are listed in the HoloMonitor M4 Setup and Operation Manual. No labels, stains or specially designed vessels are needed to run HoloMonitor assays making protocols straight-forward and easy-to-use. Mono-layer of adherent eukaryotic cells seeded in any of the recommended cell culture vessels. Download a list of cell lines successfully used: Cell Lines used with HoloMonitor.